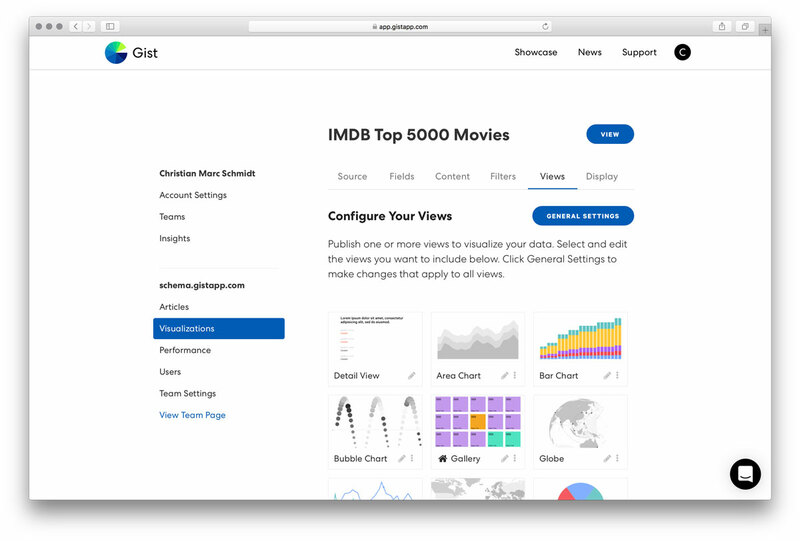 Use Gist to create simple, beautiful data applications that enable individuals and teams to explore datasets, extract knowledge, and share insights. Upload a spreadsheet, or connect to a Google Sheet or API. 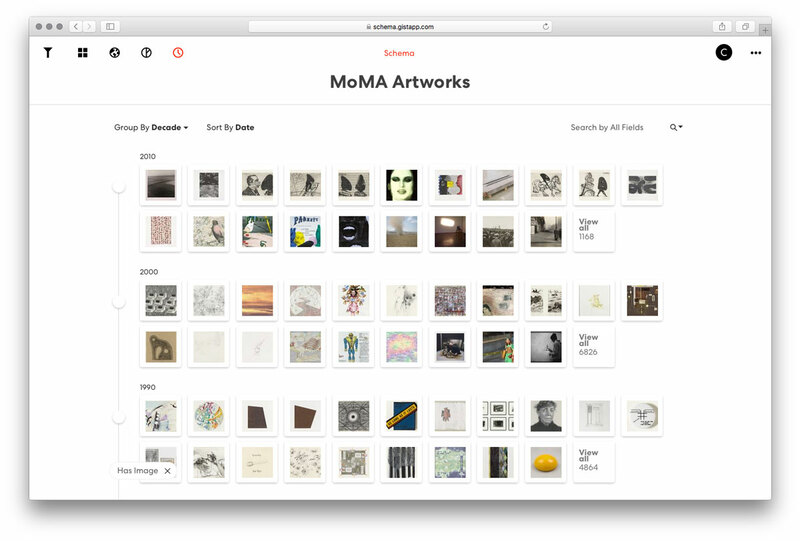 Curate your data, and visualize it by choosing from a library of different views. Publish your data application online. Embed it in an article or on your website. 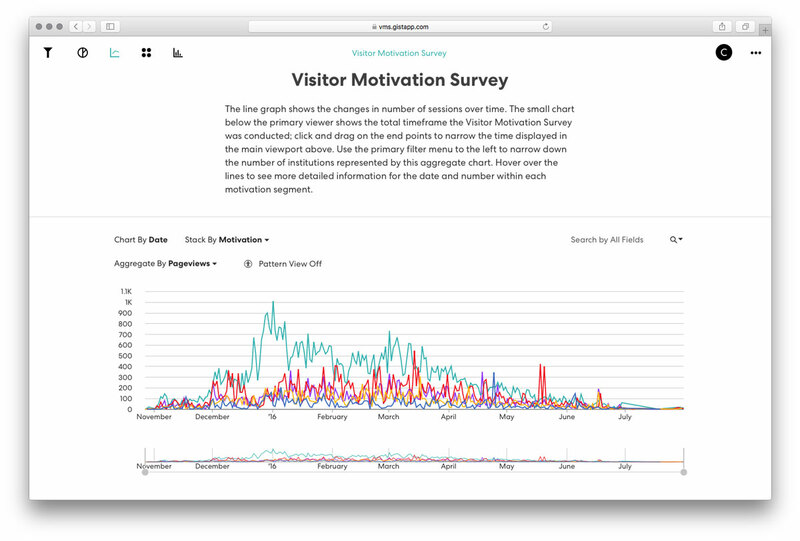 Users in teams or the broader community can post insights from your data for others to see. Open your data up to a public audience by creating easy-to-use, interactive data applications. Make data accessible through interfaces that enable pivoting seamlessly between galleries, charts, timelines and maps. Let people discover stories in data and share insights with others. Teams can collaborate around data to share knowledge and ideas in context. 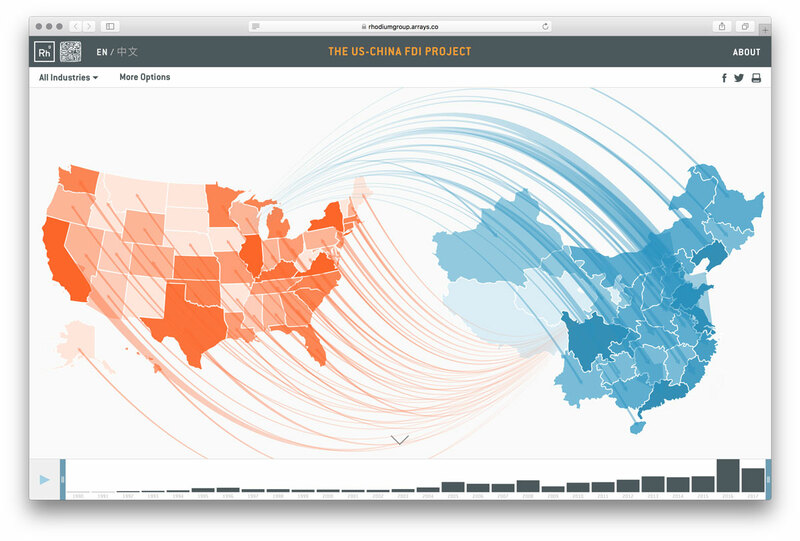 Exchange data effortlessly via fluid, interactive visualizations that let individuals discover their own stories. Post visualizations, insights and articles on shared team pages. 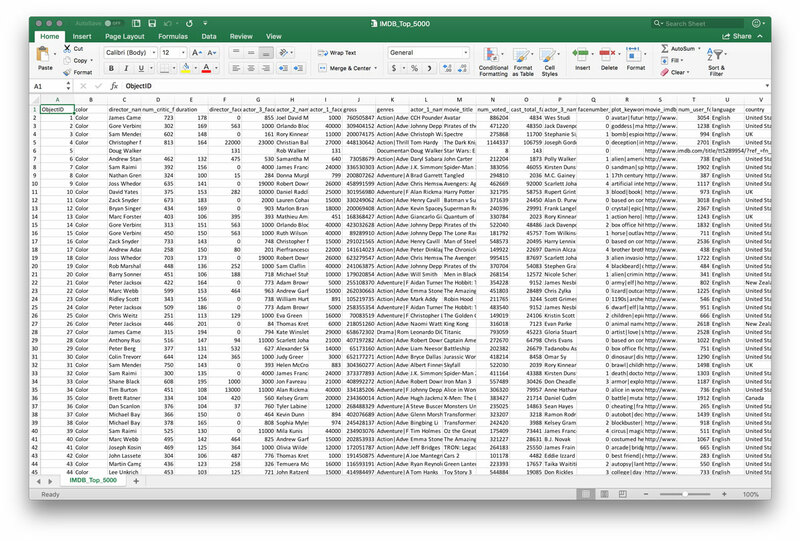 Move data buried in spreadsheets into beautiful data applications. Manage data and keep content up-to-date from a simple dashboard interface. Take full control over viewing and editing permissions, and measure the usage your applications are getting. Feed data to your custom web applications via the Gist API, or develop custom Gist applications featuring unique, innovative visualizations based on your specific needs. 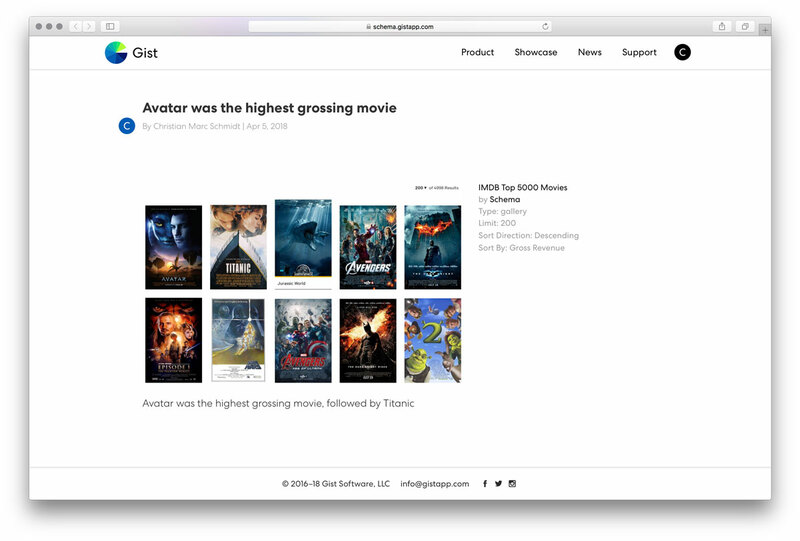 Gist makes custom data applications efficient to build, and easy to maintain. 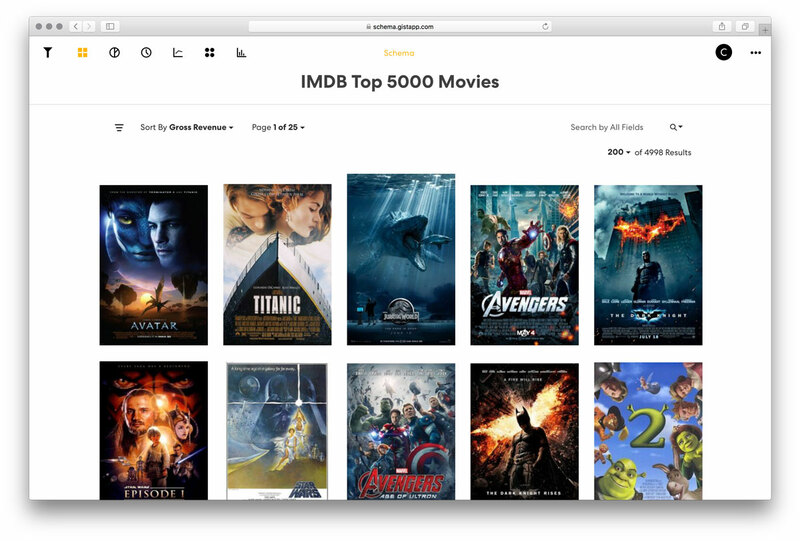 Publish a digital collection for an internal or external audience. Create engagement around publicly available datasets. Feed your CRM data into Gist and track your sales and marketing pipelines. Create dashboards for your projects and stay on time and on budget. 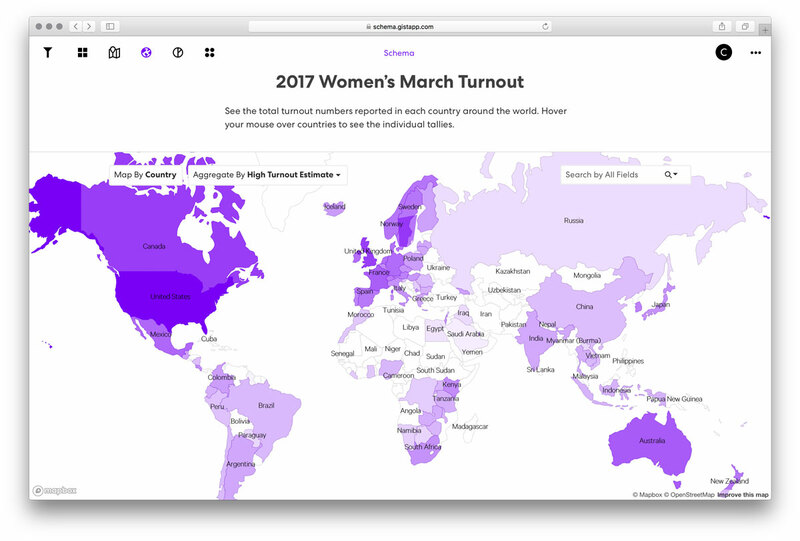 Embed interactive data visualizations on your website. Turn archives into browsable and highly interactive experiences. Visualize your entire product inventory or portfolio. Make your research visual and accessible to classrooms and teams. Arrays is hiring. View current job openings. Gist is a sister company of Schema, a research and design firm with a focus on data visualization. Schema has a track record creating innovative, interactive data visualizations for clients from Fortune 500 corporations to universities, institutions, and startups.